Board admins can set the board's visibility by clicking the board's current visibility setting, to the right of the board's name, and selecting a new visibility setting. 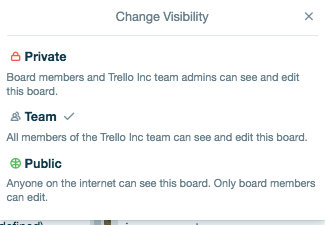 Board admins can control the visibility of a board. When a board is private, only those users added as members to the board can view or edit it. 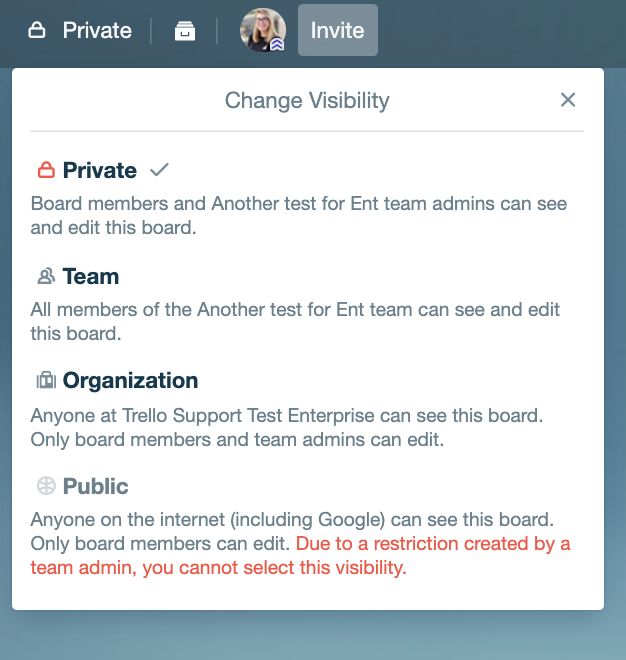 Private boards which are a part of teams are visible only to added members, unless they are part of a Business Class team or Trello Enterprise—then, they are also visible to team and Enterprise admins. A board must be added to a team to enable this visibility level. A team-visible board will be visible to members of the team. Only those users added as members to the board will be able to edit. A public board is visible to anyone on the internet and will show up in search engines like Google. Only those users added as members to the board can edit, but any person with the link can view, even if they don't have a Trello account. Setting a board to public allows all members of Trello to view your board and optionally vote or comment. You can turn other features (like comments and voting) on and off for public members via the 'Settings' menu. Note: Boards within teams that subscribe to Business Class will see additional privileges for the team's admins, such as the ability to see and edit all boards in a team.